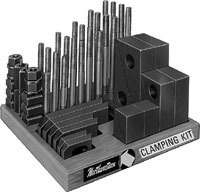 Northwestern's Clamping Kits reduce the set-up time needed on milling machines, boring mills and for other machine table operations. All the studs, nuts, clamps and blocks are kept organized, and within easy reach. When using step blocks with clamps, be certain clamp teeth are fully engaged with teeth on step block to prevent damage to block or clamp.